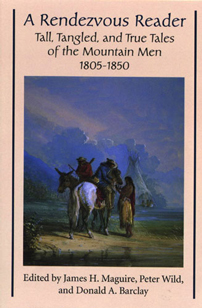 The accounts of the mountain men are spun form the experiences of a nation moving westward: a trapper returns from the dead; hunters feast on buffalo intestines served on a dirty blanket; a missionary woman is astounded by the violence and vulgarity of the trappers’ rendezvous. These are just a few of the narratives, tall tales, and lies that make up A Rendezvous Reader. This entry was posted on July 5, 2016 by mmmuseum.